Back in the saddle with my brush. It has been a real effort to get back to painting after visiting Maine. Seems I got more painting done on my days off at the Wildwood Stables, driving horses, than I do when I am home. Too many distractions. Remodeling the house, hauling hay, getting the winter wood in and just the daily distractions. My manager/partner has been great about arranging life so I can get back to the easle. I was worried I might fall out of the 'groove'. I have to an extent. 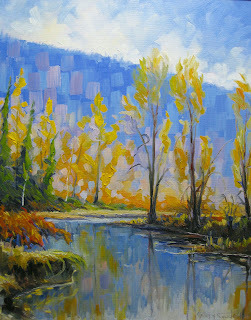 I missed the grand colors of fall, of being among the cottonwoods, painting their reflections in the river. I had plans to carry on some ideas I had developed from previous paintings that required big canvases, I even got the canvas but haven't got back in that groove which is disappointing. To get beyond that I just go outside and find a spot and lose myself in the moment. Sometimes I catch one, like these here. 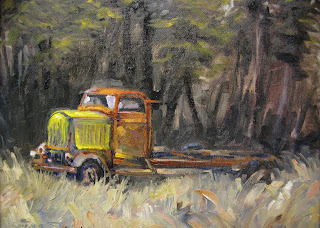 These old trucks are parked out in a field, kind of an old bone yard, typical of abandoned vehicles you find on the rez. I think that is because folks use their vehicles until they just can't go anymore and put them in the back forty for parts. It used to be horses now it is cars and trucks. If the sun isn't out or it's too cold, I work in the dungeon/studio where I get lost in technique. I'm trying to work from photographs. I don't know why as photos aren't what it's all about. For me, landscape painting is about being there, about the Place and about the Moment. I get distracted by Technique when I have all the time in the world to screw up a painting but it is consistent with a thought I have about the painting as an "artifact", that needs to exist on its own elements. Less about the effort as an attempt to make a statement or impart an observation but to explore technique and the realm of the abstract. I have to admit that it is easy for me to ramp up my painting into realms of the abstract. So far I keep myself grounded by a reference to something figurative but I suspect if I have any response that supports my 'other' work it would be easy for me to pursue that direction. I like color and I like big canvas and I like to paint. 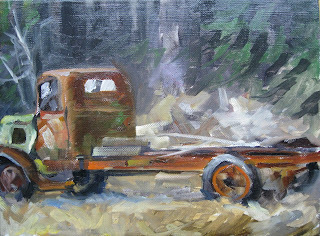 The above painting 16x20, oil is a copy of a plein air painting that came off well. Rather than try to tweak the original I did a copy using the visual vocabulary from the original plein air painting that I had acquired during the 3 hr painting session, and photographs of the site. 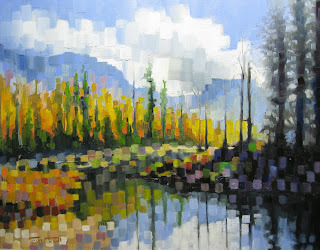 What I found is that I couldn't replicate the success of the plein air painting and ended up with a new landscape. OK fine. So then I proceeded to the painting below. Using both photos and the previous efforts and got caught up in technique. If plein air is acquiring a visual vocabulary then using that vocabulary to express more than the mundane might be where I am heading. came to me while looking at paintings in museums which are in effect paintings that have been put aside and archived, which makes them an article of interest because of the singularity which they represent. Whether it is a new fossil or new painting the article has enough significance that it is archivable. Somehow I also view paintings like tombstones which are the artifacts we use to consecrate a persons life, memorialize it, memorialize that moment in time, even if that time spans an entire persons life. Portrait of a moment.